1976 Christie Rounded Pintail, 6 ft 2"
MANUFACTURER: JChristie Surfboards, John Bull Centre, Princes Highway, Bomaderry NSW ph.044 20237. 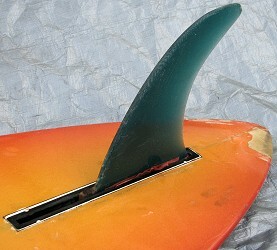 CONSTRUCTION: Fibreglassed foam blank, 1/8" redwood stringer, spray , pin lines, fin box, Lh plug. Deck: Christie,044 20237- text in blue and black at sweet spot. Bottom: Christie, 044 20237 - text in black outline at sweet spot. Deck: 1087 - pencil along stringer at tail. Deck: Clear with red/black rail lap, yellow stars and rail line, blue fade, black pinlines. Bottom: Red to orange faded spray. Donated with many thanks by Ken Grieves, Manly, December 2008.